Oh, Rado, how you have charmed me. This year, I’ve gone from not paying a whole lot of attention to the brand, to becoming rather a fan of what they’re producing – hence the song-derived title of the article. As we all know by now, they’re masters of working with ceramic, and that shows up in their cases and bracelets. I first went hands-on with one over at ABlogtoWatch last month, and now this time around, it’s you, our WWR readers, who get the review love. 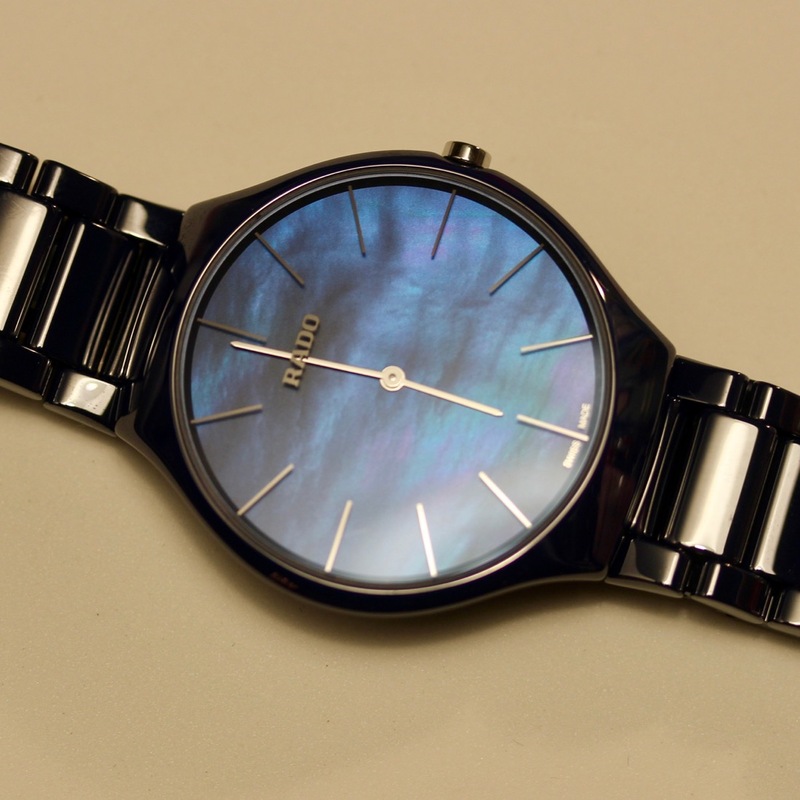 Today, we’re taking a look at the Rado True Thinline. What set me on the path of requesting the Rado True Thinline for a review loaner was actually another model that Rado released that had a mother-of-pearl dial on it, in the Diamaster lineup. That one I was on the fence with, as while the MOP was a temptation, the diamonds embedded on it were not quite my cup of tea. Fortunately, our amazing contact for all things Mido and Rado got us turned in the right direction, and I got to spend some rather fun time with the Rado True Thinline. As you might surmise, this is a thin watch. A very thin watch. The official specs have the case at 5mm, and my calipers picked it up at about 5.13mm (caseback to crystal). This is probably one of the first watches you have ever seen (if you’ve seen one) where the case is thinner than the links on the bracelet. When you’re in this arena of case thickness, it means one of two things – you’ve got a very, very high-end mechanical movement, or quartz is the order of the day. While a mechanical would no doubt be cool, here, the presence of a quartz movement will keep the price a good deal more affordable. And, for a dressier watch – which this one is – that you may not wear every day, quartz gives things a worry-free sort of ownership experience. The quartz movement also helps keep the weight down on the Rado True Thinline. How nutty would it be to have something this compact feel like a dive watch on the wrist? That simply would not compute. Here, the movement along with the ceramic used for the case and bracelet come together for a total weight of 74g (this was after I resized, so if you use all the links, it would be a touch heavier). Even the clasp got attention here – standard deployant butterfly, but in this case, it’s made of titanium rather than steel. This keeps things light, and in this execution, compact and not at all a bother under the wrist in the least bit. Once you have the Rado True Thinline on your wrist, you’re going to want to stare at it – a lot. The blue of the ceramic is certainly a draw, but you can lose many a minute just gazing upon the mother-of-pearl dial. Depending on your experiences, you may see it as something abstract. Perhaps due to the number of Joy of Painting episodes I’ve seen (and my own amateur steps into oil painting), I saw the dial more as layers of happy little clouds over a rolling sea. Your experience may vary, but I just really enjoyed looking at the dial. Photographing it was another story, but I’ve done my best here to translate it into something so you could see what I saw in my time with the watch. Once you can tear your eyes away from seeing the landscape in the mother-of-pearl, you notice something. Those indices, and the brand logo, look to be floating over the dial itself. While this may occur due to a resin coating on a dial on other watches, here, it’s something a bit more clever. You see, that printing is on the underside of the of the sapphire crystal. This leaves nothing to obscure or mar the surface of the dial, and I like it. It keeps things legible, and brings some shadows into play on the dial surface as well. The indices are in a bright silver that then mirrors the handset, and both catch the light to keep things readable in most anything short of total darkness. Would I wear it? Without a doubt. What I’d change: I wouldn’t have minded a half link in the bracelet sizing to get things just a touch looser. Oh, and hmm, if there was an option for a matte finish on the case and bracelet, that could be interesting. The best thing about it: It’s blue, it’s ultra-thin and has a giant slice of mother-of-pearl for the dial – what is there NOT to like? Next articleA crowd-funded watch-buying club? That’s what Zew Box is offering!